In the art classroom at Thunder Mountain there is something called The Lake Effect. When Lake works on the pottery wheel, everyone around him is affected! Lake is a once in a career student. 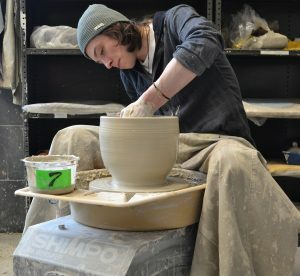 Many students have an artistic gift but with Lake pottery has grown into his passion. complicated and difficult. Lake experimented with many techniques to achieve a fit he would be satisfied with to the point of using silica carbide-a technique for professional quality precision. His 3-piece set was a testament to his skills–all lids are a perfect fit! The shapes, forms, feet, surface, and glaze pull these pieces together for a presentation that won Lake Best of Show in the 2017 All-State Art Competition. 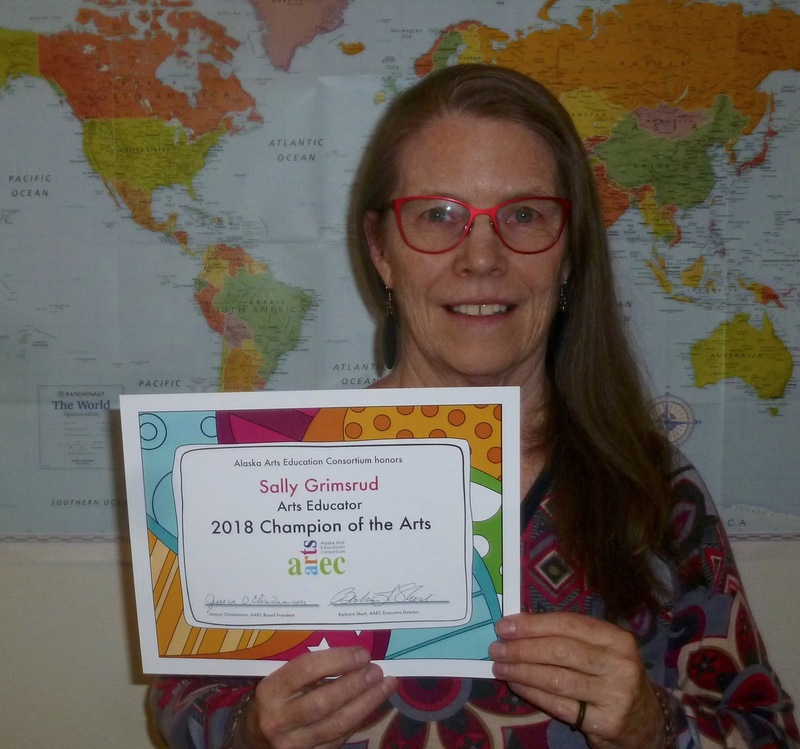 Sally has been an educator in Bering Strait School District for six years, and hired to pilot an arts program in John Apangalook School in Gambell. She will retire from teaching next year after 18 years in service. She has also been a huge advocate and force for students to show their work on local, regional and statewide levels. Along with celebrating world cultures, Sally is especially adept at fostering a sense ofplace and connection to cultural identity in the projects she teaches. For example, her class created a collaborative crankie story depicting a traditional legend from St. Lawrence Island, which was told and performed at the Yup’ik Days celebration. She has led students in creating clay sculptures of the Giant that created Sivuqaq, based on the island’s creation story. 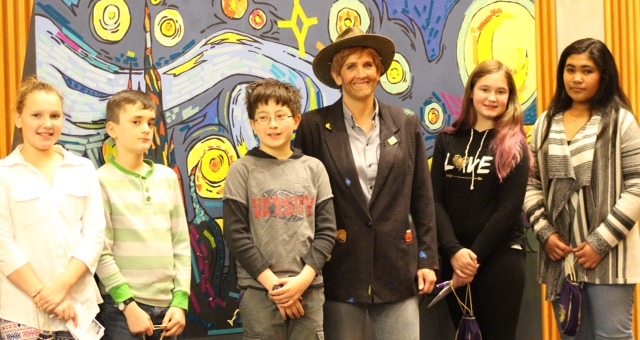 She draws from local resources and people to inspire students’s artwork. Miah is a consummate artist, down to the details in how she lives her life. She is always slowing things down, seeking out and creating the beautiful in her life with her students, family and friends. She works tirelessly in her commitment to the arts, holds very high expectations from her art students, and as a result they produce beautiful work. Miah creates everything into art, for the sake of art, championing art causes, from attending rallies with her children at the capitol, to creating a gingerbread long-house for the Governor’s Open House. In the photo are some huge puppets that Miah, her students and her mother, SuAnn Randall, made. She brought these puppets to the capitol with her children to express her support of arts in education funding. Ginger is a fantastic principal and because of her the arts have become a backbone in the Brevig Mission School. Through her tenure she has supported staff and students to cultivate and practice the Studio Habits of Mind, which help tackle everyday challenges. She is an extraordinary example of an individual who believes in the power of the arts to transform, inspire, and motivate students to be the best version of themselves. Ginger uses the arts as a vehicle to support students in expressing emotion, strengthening resilience, celebrating culture and community values, and building a positive school environment. The Alaska Arts Education Consortium (AAEC) Champions of Arts in Education Award was created as a way to formally recognize and honor individuals or organizations from around the State of Alaska who “champion” the arts in education. AAEC believes these Champions carry the torch for arts education through high-caliber instruction, arts support, and ongoing arts promotion. The application highlights the nominee’s positive impact on the lives of children and youth in and through the arts as a teacher, mentor, student, role model, and/or advocate. The application describes the nominee’s personal dedication to creating meaning in his/her/their own practice in and/or through the arts. The application highlights the nominee’s dedication, over time, to promote high quality learning in and through the arts for Alaska students of all backgrounds. The application describes at least one specific account of how and why the nominator believes his or her nominee should be recognized as a “Champion of the Arts in Education” in the Arts Educator, Arts Leadership, Arts Advocate or Arts Student category. You may contact the Alaska Arts Education Consortium Executive Director Barbara Short at (907) 322-6669 or by email at barbshort@gmail.com with any questions, or for technical assistance. The Alaska Arts Education Consortium (AAEC), is pleased to announce the Champions of the Arts for 2017. The AAEC Champions of Arts Award was created as a way to formally recognize and honor individuals or organizations from around the State of Alaska who “champion” the arts in education. AAEC believes these Champions carry the torch for arts education through high-caliber instruction, arts support, and ongoing arts promotion. This award is a celebratory action, aimed at highlighting the positive impact of the arts on the lives of our children and youth. Champions are nominated by a member of their community, and submissions are reviewed by the AAEC board. This is an annual award, recognizing the efforts of these champions in teaching and supporting arts across the curriculum reflects the mission of AAEC, which is “to promote learning in and through the arts for all Alaska students.” AAEC thanks all those who nominated a Champion of the Arts and celebrates all the nominees for their work in support of Alaska’s children and youth. Robin exudes compassion, care and love for her students. They spend their years loving and appreciating music and the ways it brings people together. She volunteers as a mentor, leading a cohort for music teachers and mentoring for 1st & 2nd year teachers. She puts on a Barnyard Bash and families come out for an evening of sing-along songs and traditional dances. This event captures the hearts of students, inspires parents and community members alike, and promotes an unprecedented love for music. Allison created a class for students with special needs and students who are typically developing to form friendships through work on the arts. Allison is a constant advocate for the arts within and beyond schools. She is and will have a great impact on our community. Debbie is the Native Arts Teacher at Kayhi and has built a thriving program. She teaches students from Kayhi and Revilla, weaving, form line, beading. Debbie works with Tribal Youth and has done an amazing job bringing Native Arts to youth. Debbie encouraged her class to submit art in our Youth Art Exhibit, we were able to see the amazing work her students do. The program often doesn’t get the support it needs and in the years she has had the program she has nurtured some very fine artists. Alaska Robotics is run by Pat Race & Aaron Suring. They bring professional writers and artists here and offer free workshops to students and adults. They partner with others to give students opportunities to produce work. They honor students by having a show one month out of the year. They sell Alaskan’s work. This year will be their 2nd Juneau Mini Comic-Con. Guests visit classes and teach methods of creating comics and graphic novels. It’s free and valuable! As I am limited to 255 character s not words, PLEASE go to their website and be amazed at their generosity! 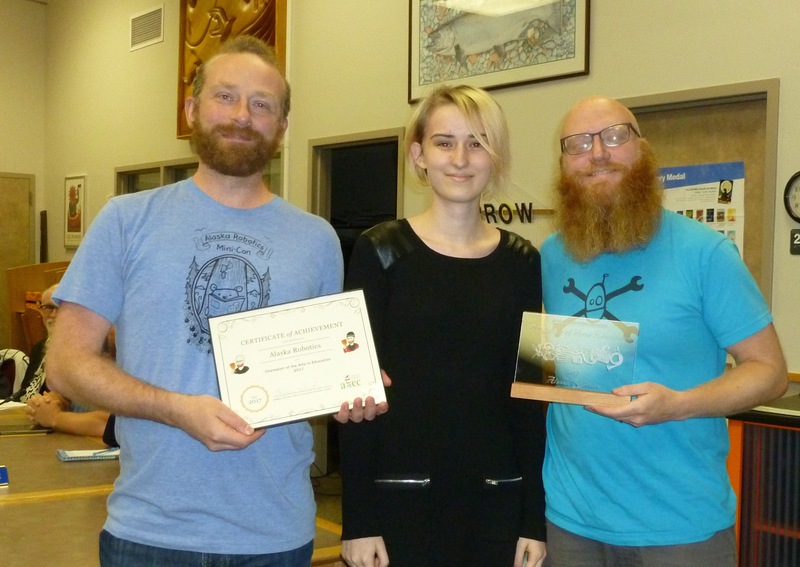 Photo on right is Clair Scott presenting award to Pat Race and Aaron Suring in October 2017. 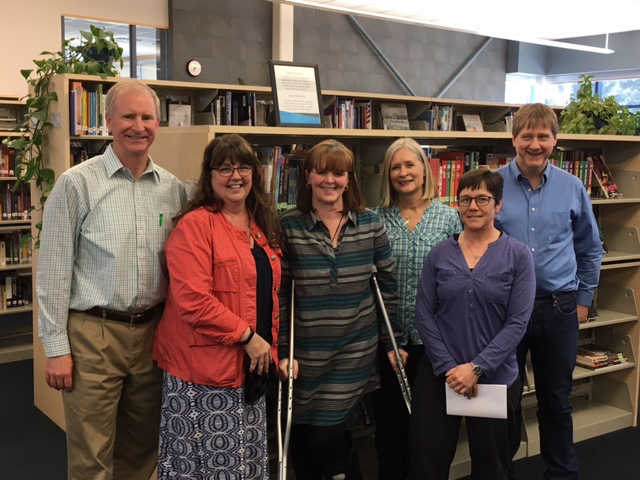 The photo includes from left: Board of Education President Brian Holst, 2016 Alaska Teacher of the Year Amy Jo Meiners, Principal Lori Hoover, Board of Education Vice President Andi Story, Incoming Principal Nancy Pool and Board of Education member Steve Whitney. Lori has been a fierce advocate of arts integration in education and has supported and helped to advance opportunities in arts integration training for teachers. 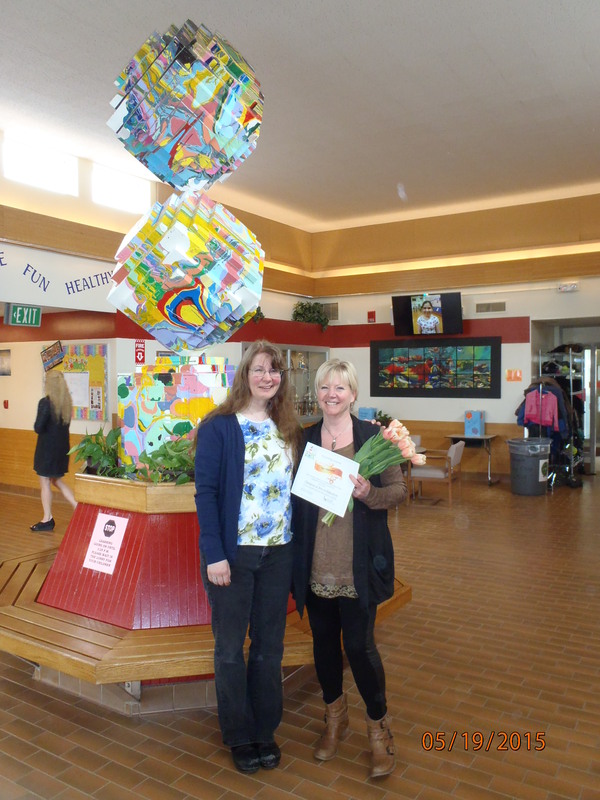 Lori has pushed ahead with arts integration and made it part of the culture at Auke Bay. 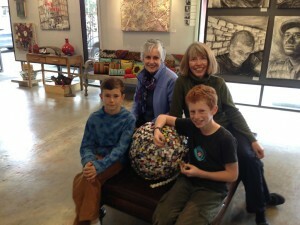 Whether sharing or learning new knitting skills or marimba pieces, she brings art to life daily. 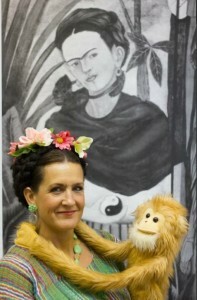 She turned the focus of learning at AukeBay to arts integration in every aspect. Lori demonstrates the power of art as a way to support students’ higher level thinking. Her abilities as a teacher and administrator have placed her in a position to have an impact on hundreds of students and the teachers who interact with them. Hoover served years on the team to bring ArtsEd.Consort. to reality in Juneau with impacts throughout the state. Complete information about the Champions is available on the AAEC website at https://akartsed.org. The Contact the Alaska Arts Education Consortium Executive Director Barbara Short at (907) 322-6669 or by email at barbshort@gmail.com with any questions, or for information about Champions of the Arts for next year. The Alaska Arts Education Consortium (AAEC), is pleased to announce the Champions of the Arts for 2016. The AAEC Champions of Arts Award was created as a way to formally recognize and honor individuals or organizations from around the State of Alaska who “champion” the arts in education. AAEC believes these Champions carry the torch for arts education through high-caliber instruction, arts support, and ongoing arts promotion. 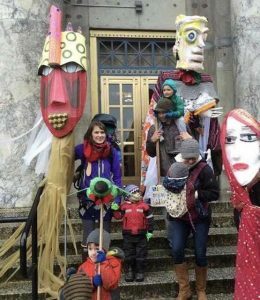 Lehnhart is an advocate for art education at local, state & national levels: in Juneau School District as an elementary art teacher servicing all students, at the Juneau Basic Arts Institute as an instructor and the national level with the Kennedy Center Program – Any Given Child program. Mandy works on multiple committees with multiple community nonprofits and agencies to bring about arts opportunities in many modalities for all ages of children. She worked to earn Juneau the Kennedy Center arts integration award. Sonny is a student at Thunder Mountain High School. He is a talented young man. Sonny is in Yearbook and Digital Arts class. Sonny is an amazing digital artist. His work has been recognized statewide and nationwide. For three years in a row Sonny Mauricio has been the leader at Thunder Mountain High School in digital arts. He was the first one to use 3D technology in art and incorporate the augmented reality into the arts. An innovative advocate for the arts, this exemplary teacher demonstrates her commitment to educating students, teaching a life-long love of the arts, and mentoring her fellow educators. She recognizes the importance of personal artistic growth. Charlie maintains the values of his Haida culture; to honor, respect and uphold those who came before him and those who will follow him. He does this by working tirelessly to make cultural arts FUN for all students and staff in the Sitka School District. Charlie recently worked with Baranof students to create a design for their drum. He demonstrated, encouraged, and guided students to create spectacular designs. John Weemes has been a visionary and leader for arts education in BSSD for over ten years as a classroom teacher, principal, and district-level coordinator, supporting visual, industrial, cultural, and media arts in 15 different schools and communities. The Alaska Arts Education Consortium (AAEC) is pleased to recognize seven individuals and organizations from across the state who champion the arts in education. AAEC believes these Champions carry the torch for arts education through high-caliber instruction, arts support, and ongoing arts promotion. This award is a celebratory action, aimed at highlighting the positive impact of the arts on the lives of our children and youth. The efforts of these champions in teaching and supporting arts across the curriculum reflects the mission of AAEC, which is “to promote learning in and through the arts for all Alaska students.” Each Champion was nominated by Alaskans who—like the AAEC—believe in the work of these Champions of the Arts to positively impact the lives of students and communities through arts in education. Teri Diamond is pictured with Debbie Harris, AAEC President, after receiving her reward. They are in front of a student made sculpture. Shanna is a Special Education Resource Teacher and still makes the time in her schedule to bring her artistic talents into regular education and Gifted and Talented programs. She has had the opportunity to write an after-school art program for Gifted and Talented. Each week they would study a different medium in art and at the end of the 8 weeks held an art show. Shanna is always bringing art into her special education classrooms as well as time and testing permits. Ms. Brazier has tirelessly and enthusiastically gifted violin instruction to all of our five Kindergarten classes (about 130 children) in the 2nd quarter of this school year. For 30 minutes each week, every single Kindergarten student has violin instruction time. It is fantastic! We have cardboard practice violins (my class has 100% participation) for home use. We have learned the four strings, proper bow grip, stance, rest position, instrument part names. It is amazing in just 30 minutes each week, she breezes in and swoops the 25+ five year old wigglers off on another musical adventure. She is a treasure! The program is modeled somewhat on JAMM (Juneau). Most requested classroom music is now symphonic or fiddle related. 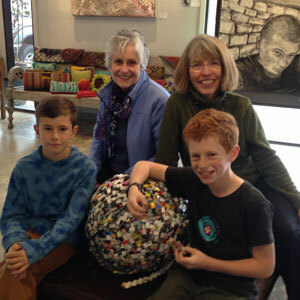 Teri has been a long-time supporter of arts education for students. Beginning when she was a teacher, she made sure her students had creative, art-making opportunities even when there was no specialist available. 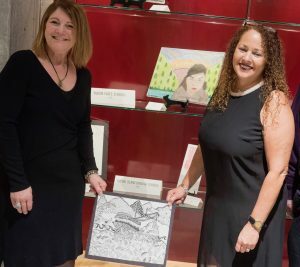 Since becoming a principal, she goes out of her way to bring artist residencies to her school and has work with Bunnell Street Art Center to help pilot their Artists in Schools residency program on the upper Kenai Peninsula. She actively encourages her staff to incorporate the arts into their classrooms and makes sure the community is part of the celebration of creativity at Soldotna Elementary. It is through Administrators like Teri that the arts continue to find a place in education. Lisa is an extraordinary educator for a number of reasons. She is deeply committed and compassionate to her students and their families. With the structure of our school, she develops each language arts and art lesson herself. I am going to list all of the wonderful things she does for our community. Within the list are contributions she has given that incorporate the arts. Lisa has contributed countless hours of her own time to our school. Examples have included but are not limited to grant writing, organizing family gatherings, helping coordinate local artist instruction within the school and peer coaching. She began ACTION (Active Community Teens Involved in Outreach for Nome) here at school. This is a student-initiated service group that has organized projects including recycling, tutoring, and special events for youth and foster children. She also organized students to help with Breakfast for Santa, and worked to set up tables and decorations and print photos. Mrs. McCue is the art teacher for Kindergarten through sixth grade students at the Tongass School of Arts and Sciences in Ketchikan. Using many different materials and techniques, Loren engages students in a variety of projects that allow students to be creative and proud of their work. 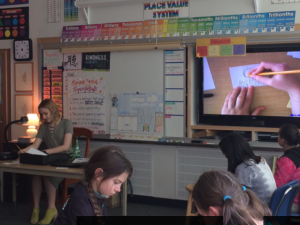 Loren teaches about different famous artists and their works, so students try different styles of art. There are a few public art displays in Ketchikan that Loren made possible. In the Ketchikan Visitor’s Center there are clay fish made by Tongass K through 6th grade students. At the Discovery Center in Ketchikan, there is another display of fish, these made with wire and beads, again created by K through 6th grade Tongass kids. Another schoolwide project is displayed on the fence outside of Tongass School, individually drawn and painted Thunderbirds, the school’s mascot. In addition to these permanent art displays, Loren has made possible many art shows with Tongass students’ art work. One example of an art show that Loren has enabled students to join is Ketchikan’s Wearable Art Show. Loren has fostered interest and talent in art at the Tongass School of Arts and Sciences and appreciation of student art in Ketchikan. While Linda Rutledge has not had children of her own in Copper River School District schools for many, many years, she has continued to serve as a champion for the arts by volunteering to spread joy through art in the Kenny Lake School, community library, and summer fair. For decades, Mrs. Rutledge has volunteered her time and talents to visit Kenny Lake School and serve as a visual arts teacher in the elementary grades. 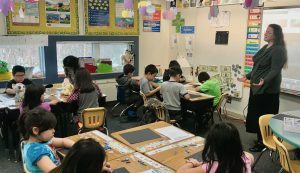 Over the years, she has helped hundreds of students learn the joy of drawing, painting, and multi-media arts by providing patient and compassionate instruction and hands-on practice in the classroom. 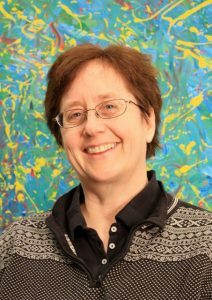 Additionally, Linda volunteers her talents to create posters, advertisements, and visual arts installments for the school and public library in the Kenny Lake community. Her work can be seen at the regional summer fair, and students and adults alike recognize her artistic style and emulate it in their own practice with pencils, pens, and paints. Linda Rutledge is one of those quiet heroes in rural Alaska who creates light by bringing the arts to places that otherwise would have none…and she is a woman who has made it her life’s work to ensure that Copper River students have opportunities to explore, learn, and grow through the arts even when no formal arts instruction was available. “Champions” don’t necessarily have to live in urban places or boast titles and degrees; sometimes they are the humble yet phenomenally talented people living next door who quietly infuse the lives of their neighbors with the beauty and gifts through the arts. Linda Rutledge is absolutely “that kind” of champion, and the Copper River Basin is a better place because of her artistic influence in the lives of those who live here. Not only does the team “make the rounds” of all the district schools delivering new art instruction several times each year – [these lessons then turn into new “check out” art kits]….. And this year they are also mentoring all first year teachers weekly by bringing in lessons and resources to help those teachers develop their skills and their confidence. 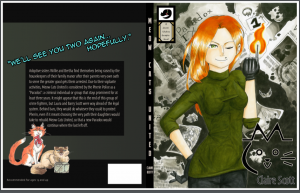 They prepare, restock and manage a huge system of terrific “ART Kits ” . Each large red poster sized bag is complete – amazingly well developed with literature, additional extensions and resources -lessons for each grade. These bags allow any teacher of any skill level the ability to share quality art instruction across a variety of media. The bags evolve and remain fresh and current with our changing curriculum but never sacrifice their essential focus: to inspire, nurture and celebrate the artist in EVERY CHILD! These teachers develop kits to be shipped throughout our large district. Each kit focuses on a curricular objective for a specific grade level. They also take the time to visit each classroom twice per year, and this year they began granting extra visits to newbie teachers. Without their influence, guidance, and creativity, many teachers might not ever consider or might be intimidated to teach art lessons. I am so very thankful to have this group of art specialists. 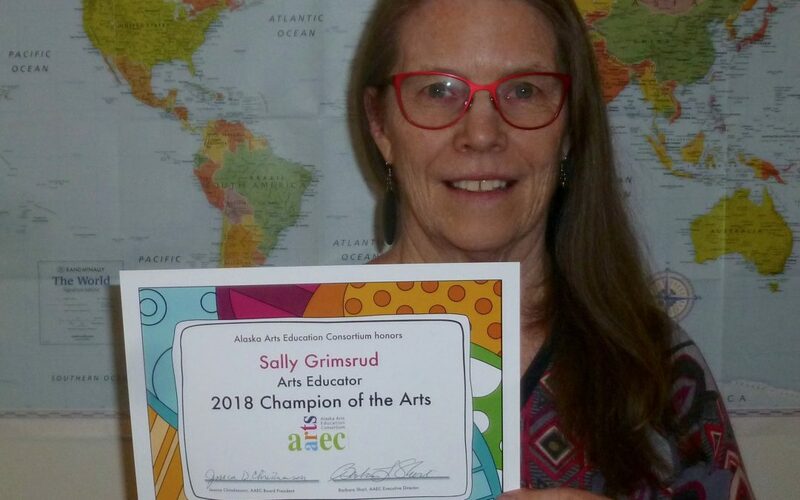 AAEC believes that Champions of Arts in Education carry the torch for arts education through high-caliber instruction, arts support, and ongoing arts promotion. Besides being a wonderful, fun experience for students, the lasting impacts on these kids include becoming more effective communicators and responsible, contributing citizens. AAEC is an affiliation of school districts, diverse organizations, and dedicated individuals committed to preparing and supporting Alaska’s educators so that they can teach the arts across the curriculum. 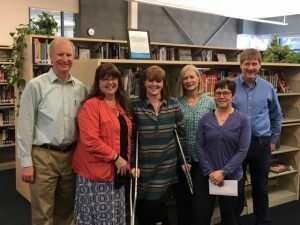 This year there are three Champions of the Arts in Education: Nancy Douglas from Sitka represents Southeast, Heidi Wright of Fairbanks represents the Interior region, and Charlotte Fox, from Anchorage, will—for the first time—represent the entire state of Alaska. All three, through their teaching and support of the arts, have creatively expanded the lives of students and teachers have contributed to the vitality of their communities, and the State of Alaska. Nancy Douglas is a Tlingit culture bearer and a natural leader. She has been a teacher working with students, families and within communities since 1986. Nancy always integrates traditional ways of life into her work and shares her belief in education and love for the culture with students and educators throughout the region and Alaska. She has been recognized for her impact on curriculum, language and literacy throughout Southeast Alaska and beyond. She continues to work to provide context to the content standards and embed habits of mind regarding the value of collaboration, creativity, and community in our lives. The value of education is something Nancy shares with all she comes in contact with, and her love for the culture and children has guided her to her lifetime of teaching. Charlotte Fox has, in a variety of roles, made a remarkable, lasting imprint on arts education in Alaska over the past 25 years. As the Executive Director of the Alaska State Council on the Arts, she professed and sustained the belief that “one day there were would be ARTS in every SCHOOL for every STUDENT every DAY in Alaska’. Throughout her tenure at ASCA, Charlotte worked toward this goal by simultaneously and successfully supporting arts agencies, artists, and arts organizations along with schools and districts. She assembled a committed, knowledgeable staff and core group of partners and supporters who continue to work to increase arts education across Alaska in a myriad of ways. 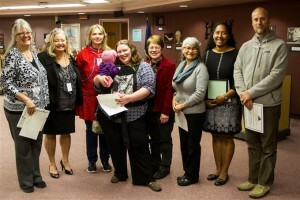 The Board of the Alaska Arts Education Consortium salutes these Champions as well as the three member districts – Sitka, Yukon-Koyukuk, and Anchorage – that recognize the importance of arts in education, and acknowledge the valuable roles their staff play by nominating them for this honor as Champions of the Arts in Education.